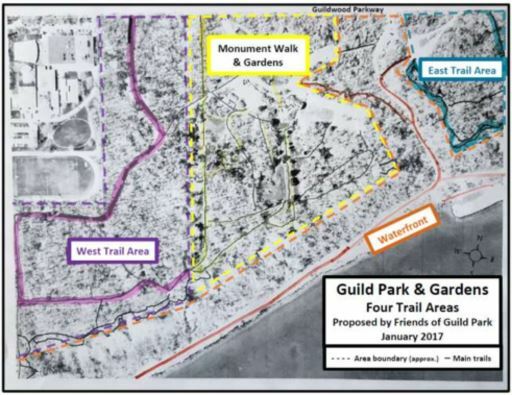 On January 5th, 2017 John Mason, President of Friends of Guild Park and Gardens presented a deputation at City hall and letter from the Guild Park Stakeholder group in support of a Trail Master Plan for Guild Park. On January 27th it was confirmed Guild Park and Gardens Trails Master Plan capital project will be included in the City of Toronto 2017 Parks, Forestry and Recreation Capital Budget and Plan. Cleanliness – easy public access to waste containers; routine servicing/maintenance of waste containers and public areas. Relate to the attributes/legacy of Guild Park – wildlife/ First Nations/pioneers/ artists etc. Heavy foot traffic by pedestrians – especially between parking areas and key park attractions during daylight and after dark.